To make the batter gluten free use only the buckwheat flour. To prepare the blini, beat the egg whites with a pinch of salt till firm peaks. In a separate bowl, mix the flours, baking powder, salt and pepper. Add the milk and mix until smooth. Whisk ¼ of the egg whites into the batter then fold in the rest of the egg whites. Heat a crepe griddle or non-stick pan to medium and coat with oil. Spoon one teaspoon of batter on the griddle and cook till bubbles appear. Flip the blini and cook for another 20 seconds. Transfer to a rack to cool down. To assemble, place the cooled blini on a serving platter and top each blini with a slice of gravlax neatly folded on it. 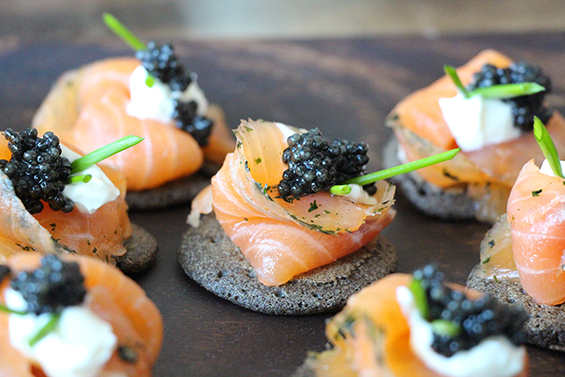 Top each gravlax with ¼ tsp of crème fraiche and garnish with caviar or microgreens and chives.